There’s that devil-horn thing metal fans do with their hands. Apparently, it is called the maloik. It’s the gesture you make with the index and little fingers while holding down the other two with the thumb. In the music world it indicates that the gesturer is rocking with enthusiasm and is encouraging others to join in. 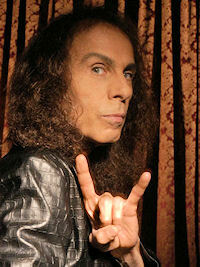 It’s associated particularly with the late Ronnie James Dio of Black Sabbath and other bands, who borrowed gesture and name from his Italian-born US immigrant grandmother. “Oh, I’m okay, Gi-money. I just seem to have a lot on my mind today.” “That’s not like you. Whassa matta? Somebody give ya the maloik?” “Maybe this guy did!” He grabs Pitt playfully. “Did you give me the maloik, you son-of-a-gun?” Pitt tenses for a punch that doesn’t materialize. Return to Forever, by Mark Salvatore Pitifer, 2005. Among Italian-Americans, the gesture guards against the evil eye. Elsewhere it can have other meanings, including the deeply offensive one of suggesting that a man is a cuckold. There are many other names for it, including cornuto and devil’s horns. Calling it maloik, as metal fans do, confuses the warding sign with the thing warded against. But who ever said rock music fans were logical?